Valerian is a very popular herb that is used for medicinal purposes for centuries. The main attraction of this herb is its distinct scent. The roots of this plant are used for medicinal purposes. This tall perennial herb is a flowering plant that has scented flowers from three different colours. I have two different shades of pink flowers growing in my garden, cerise reddish pink, a noticeably lighter pink shade, as well as a white variety. The flowers start to bloom mid October in Australia, flowering with the dwarf, median and early tall bearded iris and the first cluster of the daylily buds emerging. They will continue to bloom during the early summer months. The flowers attract different types of fly species, particularly if grown in cooler shaded areas of the garden. The Valerian is also known as the set wall or garden Valerian or garden heliotrope. Even though it is grown mainly for its medicinal purposes, there are many who grow it in their garden to add that cottage flavour attraction. You have to look at two years for valerian seedlings to clump up to bloom in their new garden location. They are an easy plant to grow and require only minimum care. 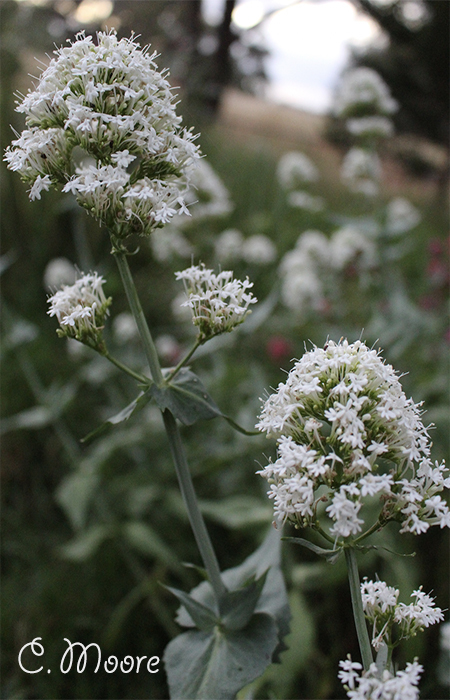 The roots of the Valerian are in demand as it has medicinal value and the plant has nerve roots. The plant can grow up to a height of 4 feet and hence you would love to plant in the back row in your garden. If you are planting the Valerian for its medicinal properties, then you need to plant it in a place where you can access it easily. The foliage of the Valerian is bright green in color and is very smooth. The stem is a hollow one. The flowers of the plant grow in umbels and normally come in pink or white color. They are fragrant and attract many flies. The stems, roots and the foliage of the Valerian smell pungent and are totally different from what the flowers smell. The mature blooms are about 2 inches in diameter and have a cherry – vanilla fragrance. They are in cluster form and bloom into and during the summers. The Valerian loves to grow in full sun or in areas where there is partial sun. It will not grow good enough to flower in the dark gloomy areas of your gardens. Planting valerian needs at least 6 hours of sunshine every day. The soil needs to be a rich one with good drainage. It is better to add organic compost in the soil before planting. It is better to start growing Valerian from the seed indoors in the flats. The seed has to be placed just about 1 cm deep in the soil. Ensure the temperature range is between 65 to 68 degrees F around 20 C spring weather. They will be germinating close to the surface as they prefer light. It will take 28 days for Valerian seed to germinate. Once the plant reaches 5 to 6 inches in height, it is time to transplant it outdoors. You need to make sure that the temperature is mild and there is no frost when you are transplanting the Valerian outdoors. The Valerian has the tendency to self-seed if you do not maintain it. The best way to prevent self-seeding is to cut back the plant once the flowering season ends. If you are looking to harvest the Valerian roots, then you need to do it during the spring or later in the autumn season as long as it is before the winter frost hits. Adding a layer of mulch during the spring or wait till autumn and recycle the autumn leaves that fall from the trees is a good option. Valerian plants do not need too much of feeding if any at all. These plants are on the list to grow with the minimal amount of fuss.